The other Aleheads pretty much know by this point that when a new Avery beer comes out, they’ll probably hear from me talking about it. Good, bad, I pretty much just talk about Avery beer regardless. It’s just this thing I’m compelled to do. No use fighting it. Best to just ride it out. 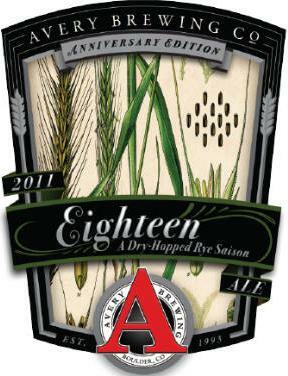 I especially have kept up with Avery’s anniversary ales in the last few years. Last year, it was a dry-hopped black lager, sort of a hoppy, imperial schwarzbier that was pretty tasty. This year, A dry-hopped rye saison. When I first heard the description, I figured that sounded extremely promising. The actual brew, unfortunately, couldn’t quite live up to that promise. APPEARANCE: Dark amber into red, fairly clear. Quite a bit darker than most commercial saisons. HEAD: 1/2 inch of persistant sweet-scented foam. NOSE: Obscure Belgian funkiness and some of the rye, mingled with bitter-smelling hops*, reminiscient of Avery IPA. *By which I mean “the sort of scent you tend to associate with really dry, bitter hoppy beers,” you know what I mean. TASTE: Complicated, very complicated. Lots going on at the same time and fighting for attention. Rather like a pro wrestling Fatal Four Way match, with combattants of Booze, Rye, Funk and Hops. Sweet and bitter at the same time, with muffled rye flavors. Kind of a confused beer that doesn’t know quite which way to go or which of the major elements to highlight. The alcohol is a little hot. MOUTHFEEL: Pretty full-bodied and with alcohol that makes its presence felt. I doubt you would want more than one. DRINKABILITY: I feel like I would have preferred the beer to push further in one direction. In its current state, there’s a lot going on, but it’s difficult to single out each element. Instead, it all kind of gets muddled together. In some beers, that fusion of different elements is something you might point out as a great quality, but it doesn’t work as well here. I think maybe a lower ABV with less present alcohol could have been beneficial to giving a more crisp beer that would allow the rye or yeasty flavors to shine through more. Ultimately, a beer I’m happy I tried, but falls short of greatness. Posted in Tasting Notes.Tagged Avery, avery 18, avery anniversary ale, Avery Brewing, rye saison. Wow. This must have been tough for you. Did they make you mail back your Avery Fanclub card? Hopefully they’ll understand that as an Investigative Journalist, I’m sworn to uphold the Newsman’s Oath of Objectivity first and foremost. Of course, Rule #1 is “Do not speak of the oath,” so just forget I said anything. What about the Meretrix? If your fanboy credentials haven’t been revoked yet, they will be if you don’t sample that release. I would love to, but I don’t think it’s distributed out in these parts. I will have to make some phone calls. For selfish reasons, I would love to get an Alehead review of this beer. This brew has been on tap at the J. Clyde in Birmingham over the past few weeks and I was thoroughly underwhelmed as well, Kid. Seems like Saisons have replaced American Black Ales as the “in thing” for brewers right now and many of the new ones are leaving me cold. There’s something about the Saison and rye combination that makes this brew drink like a very crisp lager. That would be fine if it were light, refreshing, and drinkable, but it’s none of those things. Definitely not one of my favorite Avery creations. Although, the J. Clyde staff all swore this was their favorite brew currently on tap so maybe my already tunnel-tongued tastes (it’s like tunnel-vision for your mouth) are getting even narrower. It’s interesting you say that Barley, because when I ordered it the bartender also said it was his favorite thing on tap, and today I heard another brewer at a small brewpub in Champaign say he liked it. Perhaps we’re in the minority on this one.